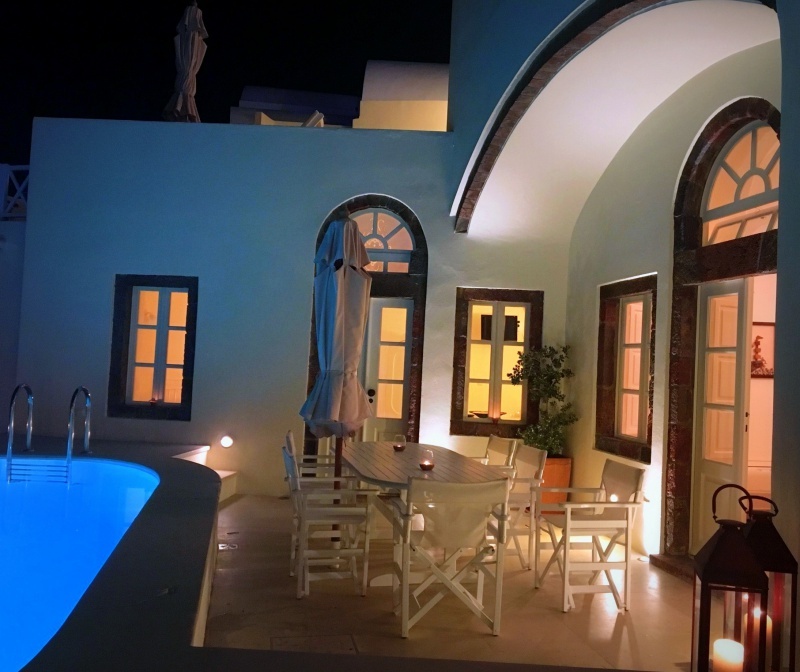 Traditional 1868 Santorinian residence, newly restored to become one of the most authentic and sought after residences available in Oia, Santorini. Licenced by the Greek National Tourism Organisation with an award that marks the luxury standard in rental accommodation. Uninterrupted breathtaking views to the island caldera and volcano, large outdoor private pool and jacuzzi, tranquility and spacious rooms with high vaulted ceilings. 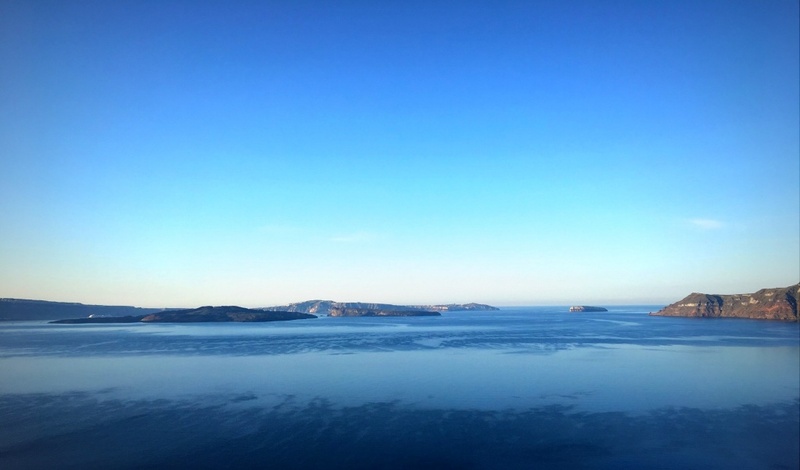 The villa is perched on the rock cliff of Oia, 300 meters above sea level with unparalleled views of the volcano, deep blue sea and the island of Santorini itself. It is situated next to the famous hotel Katikies in the finest neighborhood of Oia. Oia retains the strictest laws about architecture and even electric wires are mandated to be underground while cars is only allowed in the outskirts. 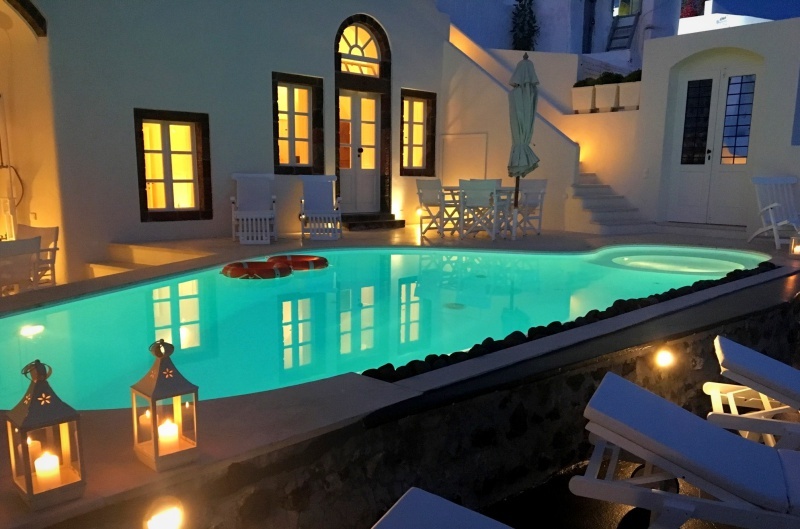 You can stay in all day and lounge by the pool or take a walk to the heart of Oia stroll by the charming little shops, cafes, artist workshops, village bakery and sweet shops. When you reach the tip of Oia you can stay and be charmed by the beautiful sunset by the castle ruins or if you feel restless continue 220 steps down the cobblestone route to Ammoudi fishing village for a swim and fresh fish. Cape Columbo Beach is 4.3 km from Grand Canava, while Naval Museum of Oia is 400 m away. The nearest airport is Thira Airport, 11 km from Grand Canava. This residence can be best described as a villa with three distinct living areas, the east, west and main canava, all with separate courtyard entrances for better privacy. Two extra foldout beds possible. All our bedrooms are meticulously restored cave style rooms with high domed ceilings in keeping with the traditional island architecture. All our bathrooms are luxury cave style indoor rooms that close with a door separating them from the bedrooms. They are decorated elegantly and built using an old traditional Santorinian technique for the walls and floors in order to retain an atmosphere of authentic Santorinian residence. They are all equipped with standard modern bathroom amenities, hair drier and hot air condition and ventilation systems. There is hot water available at all times. The west canava can accommodate 2 persons in a specious bedroom with queen size bed, a sitting area with a wooden table for two, fully equipped kitchen and a cave style en-suite bathroom with walk-in shower. There is a table and summer umbrella in the courtyard offering lounging with magnificent view of the pool, clear blue sky and the sea filled volcano caldera. The east canava can accommodate up to 4 persons in two bedrooms, a sitting room and kitchen with view to the pool and the island caldera. The master bedroom is at the back carved into the rock with a romantic queen size platform canopy bed, secluded as a separate living area with its own indoor windows and door, in a fashion typical of traditional santorinian houses. With all windows open the bedroom can enjoy light from the outside and a view into the blue while closing the inner windows and door provides maximum privacy. The second bedroom is at the front end and has a double bed that gives direct view to the pool and clear blue sky just from the edge of its pillows. Both rooms have access to a spacious sitting room with a wooden table for four and a fully equipped kitchen and they share a large cave style bathroom with bathtub and shower. There is a table and summer umbrella in the courtyard as well as loungers for sunbathing by the pool. A very spacious dining room shed with ample natural light welcomes our guests with its large monastery style table which can comfortably sit a party of 12. The kitchen is carved in the rock, at the far end of the room and is designed as a separate area with easy access to the dining premises. Two vaulted ceiling bedrooms can be found on the ground level, each separate with its own en-suite bathroom. One is especially large room at the further back end carved deep into the volcanic rock, with a platform king size bed, dressing area with mirror and a large cave style bathroom with bathtub and shower. The second bedroom is a comparatively smaller yet spacious room, with double bed, cozily snug under its own dome and has its en-suite bathroom with walk-in shower.